It isn’t often that an artist in the Hasidic world gets a remix, but Diwon isn’t your typical producer/DJ. 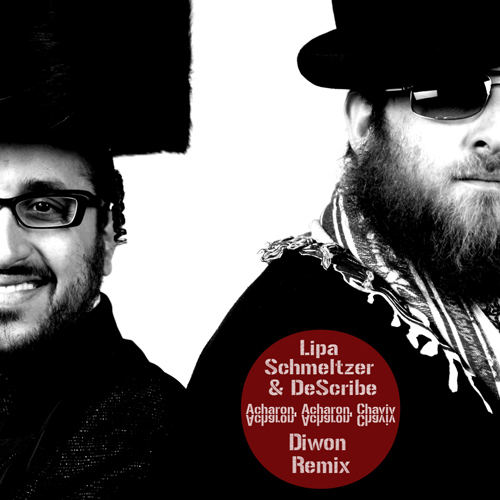 In his innovative remix of Hasidic superstar Lipa Schmeltzer’s song “Acharon, Acharon, Chaviv” (Hebrew for “last but not least), he bridges the gap between hipster-DJ style and the deep spiritual longing of Hasidic music. Add to this mix the reggae-inspired lyrics of rising Hasidic pop and dancehall artist DeScribe, and the timeless yearning for a redeemed world comes alive in a contemporary way. Composed in response to the violence that erupted in the Middle East after the Flotilla incident, DeScribe’s lyrics offer an emotionally compelling plea for peace in a troubled world where “we forget how to weep by Babylon.” His spiritual consciousness rivals that of the greatest mystics as he intimately relates, “I can feel you now, I can see you now.” DeScribe’s earnest vocals seamlessly complement the hypnotic Hebrew verses, adding a new dimension to Lipa Schmeltzer’s already moving song. Schmeltzer – known for his signature thick, round eyeglasses, sidelocks, “outlandish” outfits and comical YouTube videos – quickly rocketed to stardom in the Hasidic music world and was dubbed the “first Haredi Pop Star” by the Jerusalem Post. The remix of “Acharon, Acharon, Chaviv” is the result of dynamic work at Shemspeed, a Brooklyn-based indie label which has just released the powerful, uplifting single “Pure Soul” by DeScribe and Matisyahu for special needs children and the Friendship Circle.